CADDIE COLLECTION by Bloem: Save your back, floors, deck and carpets from damage with this heavy-duty Bloem Planter Caddie Saucer Stand. You can use the plant caddie indoors as well as outdoors to easily move big, heavy planters. This gardening accessory is made of durable all-weather polypropylene plastic and UV resistant, enabling years of functionality and reliable use. It is available in multiple sizes and colors. Designed for maximum utility, this plant stand improves drainage and is a gardening accessory you must have for large pots and planters. 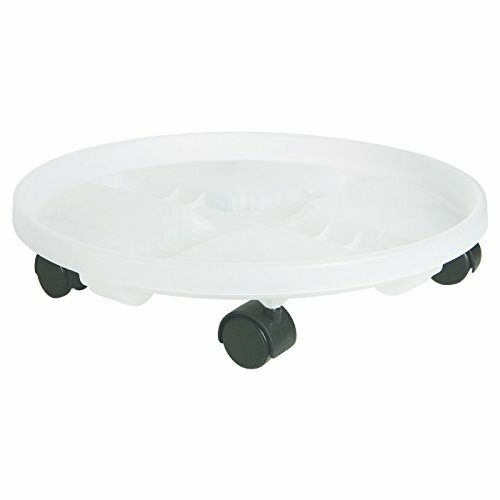 The four casters swivel in all directions, making it easy to glide the planter across your floors or deck. Use year-around… try featuring a Christmas tree in a pot by the front entrance and use the Bloem caddie with wheels to easily move your tree as needed for cleaning. Manufactured in USA. Panacea Industrial Square Plant Caddy, Wood, 16" x 16"